These Halloween party cupcake ideas will help you deliver wow-worthy oohs and ahhs. 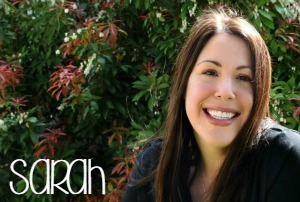 From easy to more advanced, let’s take a look at these fun ideas. If you’re putting together a Halloween party and need a sweet treat to fit the theme, look no further! We’ve rounded up the cutest Halloween party cupcake ideas for you. Be sure to click here if you’re interested in more Halloween crafts and food. It doesn’t matter if you’re looking for an easy cupcake decorating idea or one that will impress everyone. 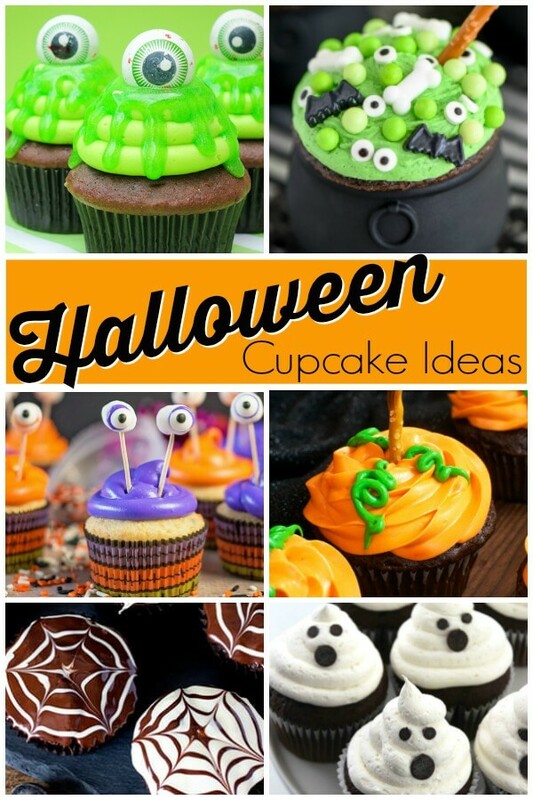 Look at these fun Halloween cupcakes and decide which is right for your party. Monster Eye Cupcakes – When I saw these, I knew we had to make them. We did and they were a HUGE hit at the class party. Easy Marshmallow Ghost Cupcakes – Here at Ruffles and Rain Boots, we are all about easy cupcake decorations and these marshmallow ghosts will be done in no time! Pumpkin Patch Cupcakes – If you’re going for adorable, these pumpkin patch cupcakes fit the bill. This simple cupcake decorating idea will leave you tons of time to relax before your Halloween party. Ghost Cupcakes – Easy? Yes. Cute? Yes. Doable by anyone? You betcha. I really like this modern ghost cupcake design. Spider Web Cupcakes – I love cupcake decorating ideas I can do without a trip to the store. These spiderweb cupcakes are easy to make with just a toothpick and frosting. Cauldron Cupcakes – I think I’m going to set up a Hocus Pocus family movie night just so I can make these witch’s cauldron cupcakes. They are show-stopping! Frankenstein Cupcakes – A little frosting does the work for you with these non-scary Frankenstein cupcakes. Kids just LOVE these! 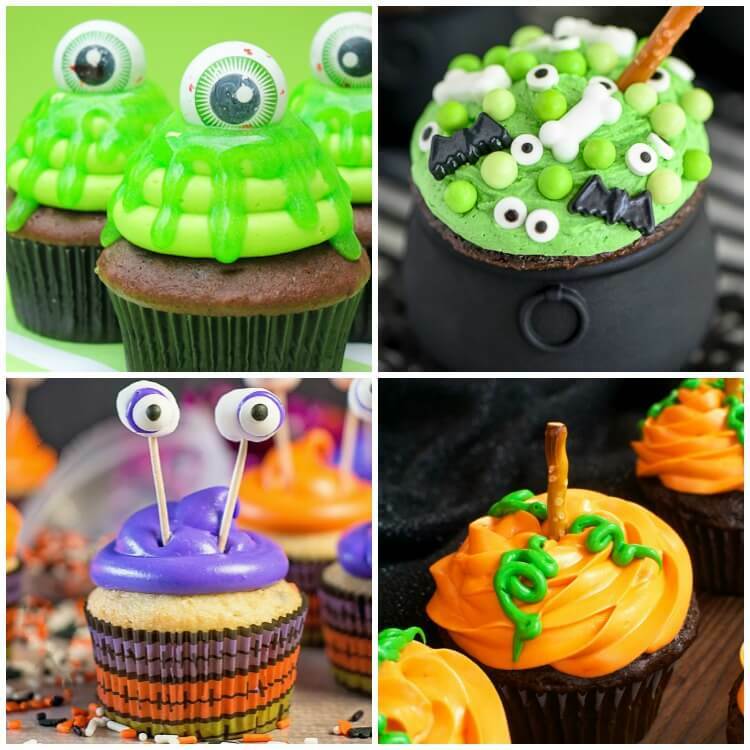 Slimy Cupcakes – Oh, these are some of the most awesome Halloween party cupcakes you could make! They are equal parts ewwwww and amazing. Mummy Cupcakes – With or without the sprinkles, these mummy cupcakes are sure to please a crowd. And I just love it when the icing tip does all the work! Witch Hat Cupcakes – Oreo lovers will celebrate these adorable witch hat cupcakes and you’ll love how easy they are to put together. Which of these Halloween party cupcake ideas is your favorite? That witch’s cauldron cupcake is calling my name. Which one will you make first?